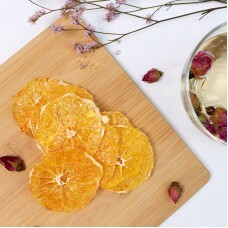 Dried Orange has great color and great taste! Each slice is packed with vitamin C! You may put a slice into water to be fruit tea or dip in chocolate for a different taste. 1. Wash the Orange, remove all the seeds and peel. 2. Slice the fruit into 3mm thickness. 3. Arrange onto tray, dehydrate the fruit at 70°C for 9 hours. 4. After Dehydrated, freeze 10 Minutes for crispy texture.